Several local authors, including award-winning author Jaimie Engle, will be thanked for their hard work contributing to the SIX HANDS feature in FOCUS Magazine over the past year. The story follows a fictitious character, Michael Green, who is faced with revisiting his past to find six people willing to carry his casket when he dies, and is set to come to a close with the final installment in the February edition of FOCUS Magazine Lake County. 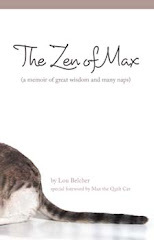 A special live stage reading of each chapter by its author to benefit Lifestream Behavioral Center Foundation is scheduled for February 1st at 7pm. The live event will be held at the Bay Street Players Historic State Theatre, 109 N Bay Street Eustis, FL 32726, and will be taped to air on LSTV. 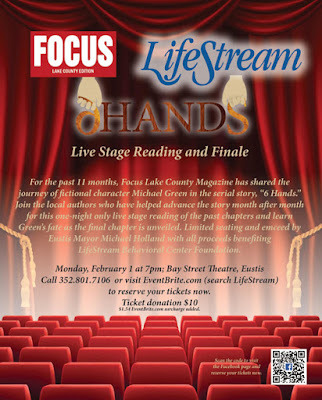 Tickets are $10 each and can be purchased through EventBrite at https://www.eventbrite.com/e/focus-magazine-lifestream-foundation-presents-6-hands-stage-reading-tickets-20146568930?aff=eiosprexshreclip&ref=eiosprexshreclip.